The first movie I ever saw in a theater was Cannon Films' adaptation of Mattel's toy line Masters of the Universe. 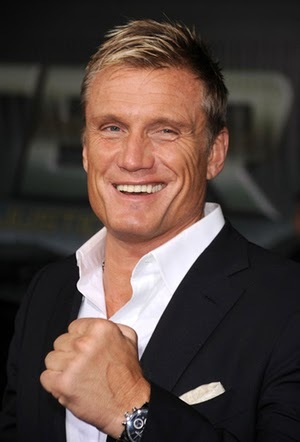 Since then I've been a lifelong Dolph Lundgren fan with his intimidating physique, sometime crazy character portrayals, martial arts prowess and general stoic Dolph-ness. While he never reached the career heights of Jean-Claude Van Damme, Steven Seagal or the man most directly responsible for his career, Sylvester Stallone, Lundgren has carved a nice spot out for himself and in recent years has only gotten more recognizable. Taking a cue from Clint Eastwood and Stallone, Dolph has directed 6 films in his long list of credits in a bid to challenge himself and take control of his fate. Recently, Lundgren has taken on a real world threat and put it into the movies with his written and produced effort, Skin Trade, which focuses on the horrible world of human trafficking. Recruiting Tony Jaa, Ron Perlman, Peter Weller and Michael Jai White, Skin Trade looks to be the best type of film, one that is born out of passion and carried through with the objective to entertain and illuminate. Rewinding a few years and Dolph was a self described skinny wimp at age 16 with asthma. Taking up full contact Kyokushin Karate and by his late teens was a heavy weight champion competing in his homeland of Sweden and traveling to the United States, Australia and the United Kingdom. 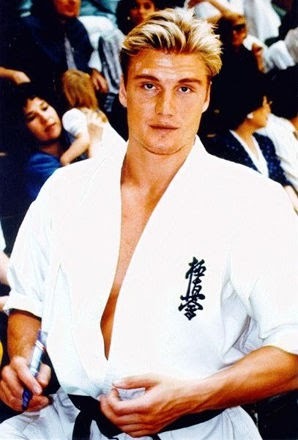 Of course karate wasn't exactly a career back then so Dolph took after his brother and father and studied Chemical Engineering at the Royal Institute of Technology in Stockholm as well as Washington State University. In the early 80's, Lundgren received a Fulbright scholarship to M.I.T. but had 6 months off in New York before classes started. He then met singer Grace Jones and traveled with her to the set of James Bond picture A View to a Kill where he was given a walk on role and history was about to be made. Delaying his further studies, Dolph went in for a cattle call audition that ended up being for Rambo II and Rocky IV. Originally being dismissed for being too tall (6'5"! ), Lundgren had a friend snap some photographs of him in boxing gear and sent them off to the casting agency. Months later he received a call to test for the role of Ivan Drago, a seemingly unbeatable, scientifically enhanced boxer from the Soviet Union. With 3 months to prepare, Dolph began to work on gaining weight to play the formidable heavyweight destroyer. As an athlete, overly developed muscles would waste his bodies natural system as whether you're 100 or 400 pounds, you have the same amount of blood flowing through your veins and aerobic capacity. Upping his time in the weight room and scaling back on cardio, Dolph began a high protein, low carb diet that he really had no idea how to go about. By the time the screen test arrived, Lundgren was a solid 248 lbs while the two other actors auditioning were heavier and smoother. Dolph maintained a quiet persona a la Clint Eastwood while the other candidates screamed and went over the top. A call the next day from Stallone himself confirmed Lundgren had the role. Now it was time to get in cinema shape. Working out for hours with Stallone, the two built up their bodies and muscles that boxers generally don't have. With 5 months until shooting, the duo started off lifting heavy for 2 hours to put on mass on a 3 day split of Chest/Back/Shoulders, Arms and Legs with 2 hours of boxing daily. By the end of prep, their lifting time decreased dramatically and boxing work was upped to 4 hours daily.